Key features: 1. 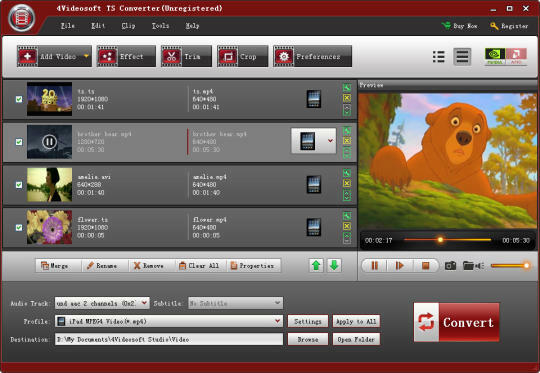 4Videosoft TS Converter is able to convert TS video to the popular videos like MP4, MOV, M4V, AVI, WMV. These videos are able to play on your portable devices like Samsung Galaxy S6, HTC one, BlackBerry, iPhone 6s/6s Plus/6/6 Plus/5s/5c, iPad Pro, iPad Air, iPad mini, Nokia and Sony. Also, you can convert other videos to the popular video formats. It can extract audio to MP3, AAC, AC3, AIFF, M4A and MKV. 2. 4Videosoft TS Converter enables you to modify the Effect by adjusting Brightness, Contrast, Saturation, Hue and Volume; trim the video length; Crop the video frame; add text and image watermark. When you edit your video, you are able to preview the original video and output video. And you are allowed to merge several videos into one. 3. You can choose Audio Track and Subtitle for your video. And you are allowed to reset profile settings. Such as reset Video Settings by Encoder, Frame Rate, Resolution, Aspect Ratio and Video Bitrate and Audio Settings provides Encoder, Sample Rate, Channels and Audio Bitrate. 4Videosoft TS Converter provides you high conversion speed and quality, just a few clicks you will finish the whole conversion process. Convert MXF, AVI, FLV, DIVX, TS, M2TS, TOD, MOV, M4V or MKV videos to MP4 format. Convert your video files between various formats. Convert MXF files to different formats. Download and convert/edit/play/share FLV video, make ISO/GIF.